As I write this, I’m watching “Til Debt Do Us Part” on CNBC. Gimmicky, but interesting to see people share their budgets on TV. It took me a while to figure out that they’re all Canadians. Everything just seemed a little . . . off. 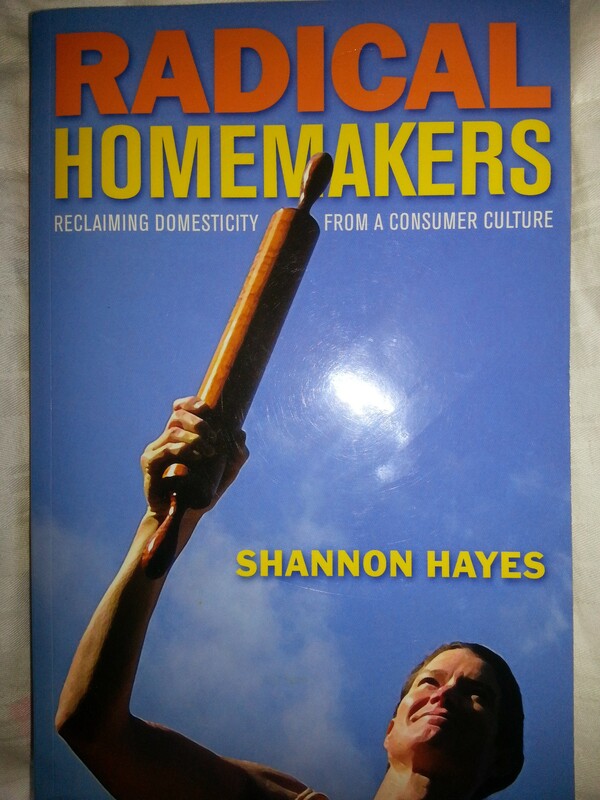 Anyway, my real purpose tonight is to give you my thoughts on the book Radical Homemakers, by Shannon Hayes, which I did in fact finish rather quickly. A summary of the book’s main points: Before the Industrial Revolution, the home was a center of production. Men and women both worked at home to produce everything the family needed, more or less. Since the IR, and especially after advertising became a strong force in the 1920s, the home has become a center of consumption, and men and women have lost their self-suffciency skills to the point that they are dependent on their wages. Thus, modern life consists of needing to buy certain products because we are too busy/don’t know how to get by without them, and getting into a cycle where we work more hours in order to pay for such products and also in order to buy things (like fancy vacations) that will allow us to de-stress from said long hours. The book is about breaking that cycle, about being happy with less and working less. Hayes returns over and over to her four pillars: family, community, social justice and care for the environment. If your current living/working situation doesn’t allow you to honor those four, she’s encouraging you to find one that does. Hayes takes care to explain that radical homemaking is not antifeminist. She is not advocating a system whereby women are housewives and men earn wages. Radical homemakers are men and women, working together to run the home, although at various times and under various circumstances one or the other may work outside the home. Food is a major component of Hayes’s philosophy. Many of the Radical Homemakers grow their own food, in an effort to save money, build up their local communities, be healthier, and be kinder to the environment. Hayes also addresses concerns over how to afford health care, education and retirement without working a conventional job. Overall, I find the RH philosophy attractive. I feel like someone has come along and validated many things that I have been feeling or starting to sense for quite some time. I have felt for a long time that I want to be at home, that I get the most satisfaction out of running my home. And not just to be with my son, but to be in control of all aspects — food, cleaning, gardening, repairs. But it felt unfeminist to admit to that. I thought I was just lazy, or maybe hadn’t yet hit upon a career that would make me want to work hard outside the home. And as I have mentioned before, I think that my husband and I are already on a sort of minimalist path. We have generally been more interested in carving out time to hang out as a family and follow our own interests than in acquiring wealth or stuff. (He is more of a workaholic than me, but in a bipolar sort of way; he tends to work extremely hard for a while then be extremely lazy in equal proportion.) We also have long embraced the concept of interdependence with others that Hayes espouses. We are very, very interdependent with our families (at times, dependent!). It has always seemed to me that you can accomplish more as a group than as an isolated unit. I have some quibbles. I think Hayes sort of glossed over the health care issue. Her basic point, that people let fear of going without health insurance keep them shackled to unfulfilling jobs, is probably true. But her alternatives (eat healthier and you won’t get sick, put your kids on a free state program, buy insurance privately) are not always realistic or appealing, at least not the way she described them. I’d probably have to go back and read this part again to comment better. Also, this book was written before the health care reform act passed. But generally, I would not advocate going without health insurance of some kind. And there is something to be said for getting a paycheck for the fruits of your labor. Cash gives you a certain amount of power and independence that bartering never will. So what does this all mean for me personally? Other possible areas of implementation: me not going back to work after the baby is born [my middle son] and attempting to achieve non-employer-provided health care/insurance. And ostensibly, if I were home I would be able to spend more time on home-based production of all kinds: baking bread? making soap? Certainly, I’d be in a better position to address needs/problems myself rather than just throwing money at them (for instance, the $250 I threw in desperation at “Mister Ray” to finally get rid of our squirrels last week). I think I would want to work in some fashion — I would definitely look for freelance writing/editing assignments. Even short-term full-time contract work. Or perhaps looking after one extra child, a few days a week. All of these fit into the RH life because you are still basically your own boss. Ultimately, what’s most appealing is the simplicity. It makes sense. It has always felt absurd to me that I have to pay someone to watch my kid. Just in an Occam’s razor sense, it’s like, hey, why don’t I do that? The other day at work, an email was sent out from this new “Wellness” committee. Basically its goal is to improve employee health. Its first project was something called “walk at lunch day,” encouraging (I think with some kind of reward) us to walk 30 minutes at lunch out in the city. There’s definitely something wrong when we have to have a committee schedule our exercise. If we were all at home hoeing our gardens, mowing our own lawns, running after our own kids, painting our own fences, etc. . . . So wish me luck. Hi ho, hi ho, it’s back to home I go . . . I couldn’t agree with you more! I do struggle daily over my lack of monetary contributions to the household. I lament every 2 weeks, when I grocery shop, over how tough it is to stick to the budget. We are minimalists in that we have not had cable TV in 16 years and have never had smartphones or “mobile devices” (we have a cellphone from 2003 that barely holds a charge, but we rarely use it anyway). We have blueberry bushes, several different veggie and fruit plants, and eat in season (buying very little processed foods). With two special needs kiddos (and my special education certification) it only makes sense for me to be home with our boys , at least until we can get them “settled” in school in a few years (lmao, I am told that this is not something I should ever count on in this journey through autism). My husband stayed home that first year with Isaac, as I taught. When I was laid off (or layed off, I always wonder about that grammatical/spelling issue), we moved into my in-laws house as caretakers (they live overseas), to save money, and with teacher’s positions dwindling (along with their salaries) I decided to stay home. It never made sense to me to pay someone else to watch my children (especially as an educator) so that I could go off and educate other people’s children to pay for a less qualified professional to take my place. So my husband went back o work as a web developer/programmer, to make money, when his passion is in ethnobotany (his UPenn degree is the biggest bill we have every month, and he is not using it, because anthropologists do not make a living wage). I could talk about this forever. The next topic I would love to hear you tackle is the issue of monetary contributions to the home vs. the variety of non-monetary contributions of a stay-at-home parent. Thank you! It is great to hear that other people are on this path and what their specific path is like. It’s inspiring. I really want to get rid of cable but there is resistance from the husband. I hear you on the non-monetary contributions. One of the biggest things that held me back from leaving my job was the fear that as someone not contributing money, I would lose my say in decisions. I’ll definitely be writing about that soon.